A two-cell church, which is possibly C11 or C12 in origin, though most detail is C13 or C14. In 1872-73 it was extended at both ends. 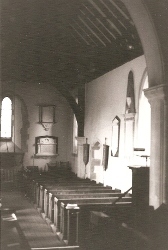 The church, the original dedication of which is lost, though it is now known as St Peter, stands at the southern end of the parish near Woodmancote Place. A fine yew walk flanks the approach in the churchyard. Though it is mentioned in Domesday Book (13, 22), nothing of this period is identifiable and a blocked round-headed north doorway, though called C11 or C12 (VCH 6(3) p159) and now only visible internally, is late C12 at the earliest, judging by its proportions. It may be the first of the otherwise C13 and C14 changes that determined the character of the church until the C19. In the early C13 the chancel was extended and the Sharpe Collection drawing (1802) shows a round-headed south-east lancet, which can have been little later than the north doorway. The jambs of a south west doorway are probably of the same date. The Burrell Collection drawing (1777), Quartermain ((E) p286) and Adelaide Tracy (III p24) (1853) all show the view from the south east, so the appearance of the north side is unknown. Common to all three is a pair of ogee-headed south lancets in the nave and enough of the moulded south doorway remains to show that like them, these were C14. The nave roof has some old timbers, and until 1872 there was a boarded bell-turret with a pyramid cap. A further, though smaller pair of ogee-lancets at its western end shows the chancel was also remodelled in the C14. 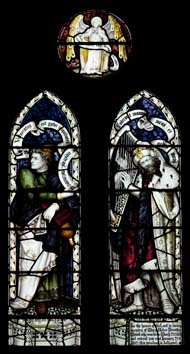 The then three-light east window with panelled tracery may have been contemporary with a north window known from a bequest to have been under construction in 1406-07 (SRS 45 p411). The Burrell drawing shows a C17 or C18 porch and partly blocked windows. There were plans for restoration and extension in 1868-69 (WSRO Ep II/27/257), but H Woodyer started work only in 1872 (B 30 p533) and finished the next year, the date on his characteristic rainwater-hoppers. 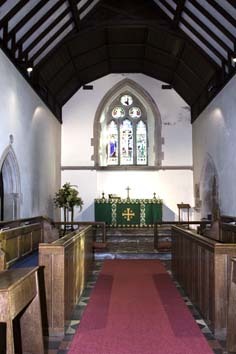 He extended the chancel with a new east window and and inserted similar south ones of plate tracery, which, like the chancel arch, show him in late C13 manner. The roof is dark and shiny. 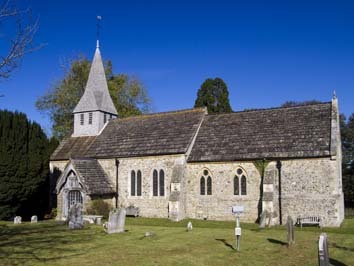 He also extended the west end of the nave, with a new bell-turret with a broach spirelet and mostly paired lancets. Finally, he replaced the porch with a large timber one. Horsham slabs now cover the whole roof, including the large vestry to the north of the chancel whereas the Sharpe drawing shows tiled ridges. The vestry is the most ostentatious part of Woodyer’s work, with a shouldered doorway, a half-hipped dormer and a big round chimney. Overall, though, his budget was modest, amounting to only £1208 (PP 125). 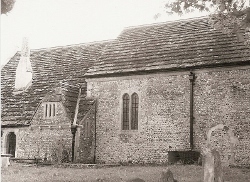 The north side of the nave is today largely concealed by a recent extension, built in flint and brick to match the rest. Font: Early C13 square bowl of marble and smaller than usual, it was heavily reworked in the C19. The capitals for the renewed corner shafts are carved into its base with stylised foliage. 1. (South chancel, first and second windows) C E Kempe, 1894. 2. (East window) Burlison and Grylls, 1894 (CDG 11 (1894) p180) (Crucifixion). Collins (p318) remarks on the close similarity with Kempe’s work of the same year, but its authorship is well attested. 1. Officers of the 47th Bengal Native Infantry By T Denman (Roscoe p362). 2. (Churchyard) Good C18 carved tombstones. 3. 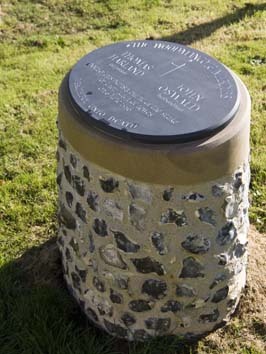 (South east churchyard) Modern monument of flint in the shape of a drum with the inscription on the flat top in memory of the two men from the parish, Thomas Harland and John Oswald, who were burnt at the stake as heretics at Lewes in 1556. Screen: A screen by Woodyer was removed in 1964 (Elliott and Pritchard p243). 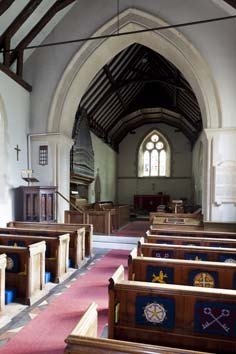 Sedile: (South chancel) broad and chamfered with a label. It could be C13 or C14.